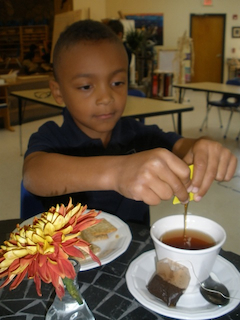 Thank you for your interest in Riverstone Montessori Academy! Choosing a school for your child is an important decision and well worth your time and thoughtful consideration. Curriculum, teacher training, test scores, acceptance of students regardless of academic ability and policies of inclusion are important considerations when choosing a school and Riverstone Montessori encourages parents to compare these qualities. 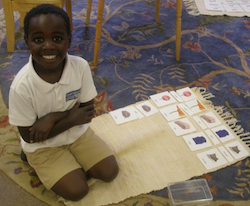 Prospective families should schedule a tour and enjoy the opportunity to observe the AMI Montessori program in action. Submit your application and the non-refundable Application Fee of $100 to Riverstone. As appropriate (required for Elementary and Adolescent Program), submit the authorization to request transcripts from previous schools. All prospective students and parents are interviewed for their acceptance and understanding of the Montessori philosophy and expectations. Remedial and advanced students are given equal consideration. Upon acceptance, a signed enrollment contract and accompanying fees are due to hold a student's position. Riverstone has very high retention and our classes fill quickly. We advise families to plan ahead when considering Riverstone Montessori Academy for their child. With Maria Montessori's child-centered approach to learning at their core, our programs foster independence, creativity and moral development. Through our skilled staff, AMI certified teachers, and parent partnerships, RMA has created a nurturing environment designed to instill peace and to support the intrinsic love of learning in each child. Check back for dates of upcoming information sessions. Tours are held on most Tuesdays and Thursdays at 9:00am. If you would like to tour Riverstone, please contact the office to schedule. Riverstone Montessori Academy has a non-discriminatory policy relative to gender, race, color and national origin with respect to the admission of students and the employment of faculty and administrative staff. The basic school supplies your child will need for the entire school year. Eating food that is enjoyable as well as good for you is a nutritional habit that we wish to help develop in our children. RMA provides our students with a tasty, well-balanced lunch that is made with fresh fruits and vegetables, minus preservatives! This is no ordinary school lunch; each meal is prepared by local chefs and delivered to our school daily. Meals are designed for nutritional content and are mindful of most allergens.